Bethesda has revealed the first bunch of Fallout 4 DLC we can look forward to. There are three instalments coming, so let's break them down. The first, Automatron, touches down in March for the price of £7.99/US$9.99. This will let you build your own custom robot companion using harvested parts from robots that have been unleashed into the Commonwealth. You'll use said parts, mixing limbs, weapons and abilities - and even altering the voice - to create your perfect sidekick. Wasteland Workshop will launch in April for £3.99/US$4.99, and brings a Pokemon-style twist to the Wasteland, letting you design and set cages to capture wandering creatures, tame them, and then set them against other creatures - or settlers. There's also a bunch of new design options for your settlement. Last but certainly not least is Far Harbor, which will arrive in May for a steeper price of £19.99/$24.99. This introduces a new case for Valentine's Detective Agency in which you search for a woman and a secret colony of synths. 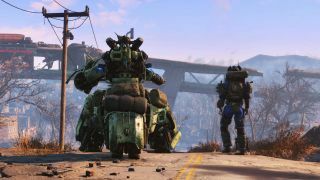 It's the largest landmass for an add-on that Bethesda has ever created, the company claims, and will also include new quests, settlements and weapons. Bethesda also confirmed that it the season pass will increase from the current £24.99 to £39.99 (US$29.99 to US$49.99) on March 1. If you already have the season pass (or buy it before March 1), you'll be unaffected by the price hike. Finally, Bethesda confirmed that it will be running closed betas for the new DLC instalments for consoles and PCs. If you make the cut (by signing up on Bethesda's site) you won't have to pay for the DLC when it arrives in its finalised form. That's not all - Bethesda has promised more DLC in 2016, along with some new features, such as an overhaul of Survivor Mode.